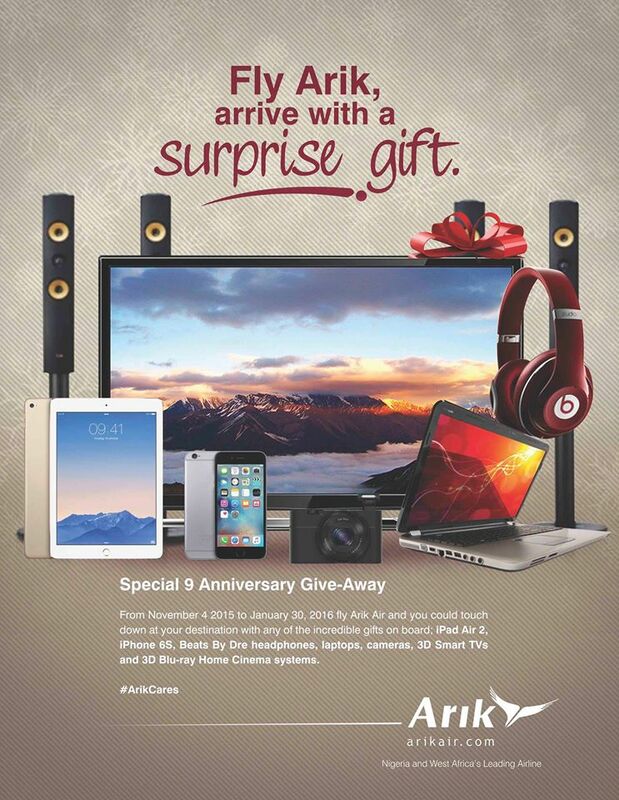 Arik Air launches ‪#‎ArikCares‬ brand initiative. The #ArikCares initiative is marketing program that gives back to our passengers and rewards them for their businesses through the years. This program involves giving out surprise gifts on selected flights passengers. The winning passengers are picked via a lucky/raffle draw done mid-flight using ticket numbers of all passengers onboard. Gifts to be given out onboard include a number of iPhone 6S, iPad Air, Beat by Dre ‘Studio’ Headphones, 20-megapixel/1080p digital cameras, laptops, 50-inch 3D Smart TVs and 3D Blu-ray Home Cinema systems. Visit our website www.arikair.com to book ticket online or call our 24-hour Customer Care Centre on +234 (0) 1279 9999 for more information. The #ArikCares program will run from Nov 4th 2015 to January 30th 2016.